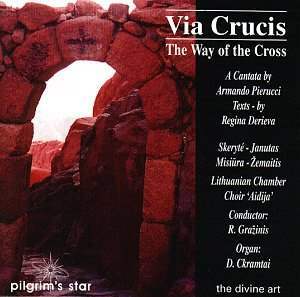 Pierucci's cantata "Via Crucis" is a most remarkable work. The text was written by the Russian poet, resident in Israel, Regina Derieva and consists of a cycle of philosophical meditations on the fourteen Stations of the Cross together with a poem "Kto tam" which forms both the prologue and epilogue. It was set to music in 1996 for soloists, chorus and organ by Fr Armando Pierucci, organist at the catholic Church of the Holy Sepulchre in Jerusalem. It has now been recorded for the first time (March 1998) in St Kasimir's Church in Vilnius, Lithuania by the "Aidija" Chamber Chorus with four soloists - all of them graduates of the Lithuanian Academy of Music and established singers on the international opera circuit. The recent date of composition need not deter listeners who consider themselves generally untuned to music of the late 20th century. The music is highly traditional and, whilst it is in no way derivative, it will appeal to those who love the choral music of Faure, Rachmaninov and Elgar. The music does not tire after a few hearings; indeed its spiritual depths become gradually more appreciable with repetition. As with all great music, it can be perceived at different levels; individual listeners will no doubt find it their own particular exploration of interior emotion. Two complementary but distict modes of listening recommend themselves: One is the more systematic - to follow the translated text of each meditation whilst reading in parallel the prayers from the Missal which accompany Christ on his journey from death sentence to crucifixion and burial. This approach may well appeal to practising catholics in their passiontide devotions. The other mode is to allow the ineffable qualities of the music and Russian words to take one on a less defined psychedelic journey without giving too much analytical thought to the literal meanings. Like Elgar's "The Dream of Gerontius", this work is at once both explicitly anchored in christian (indeed specifically catholic) faith, and at the same time resonates with all those (of any religious faith or none) who find inspiration in the drama of the journey of the human soul through direst adversity to an ultimate state of joy and triumph. Throughout most of this cantata, the words and music match (either obviously or more subtly) the events of each Station: for instance, the exchange between mother and son at Station 4 is directly mirrored in the antiphonal singing of the bass and mezzo-soprano soloists. On occasions however, the connections are less clear: what precisely has the meditation on the Light of Heaven at Station 5 to do with Simon Cyreni's carrying the cross of Jesus? And why is the nailing to the cross of Station 11 set to a vigorous Allegro choral fugato? There are surreal elements in this music! Be that as it may, the joyful fortissimo ending of Station 14, with its anticipation of the Resurrection triumph, is the most fitting climax of the whole cantata toward which the earlier quiet contemplative movements have been inexorably leading. The quality of choral and soloist singing is of high excellence throughout - likewise the organ playing; it is a pity there are no biographical notes about the organist D.Ckramtai. A question that must be asked is: Why were operatic soloists, excellent though they be, employed in this recording? Unlike oratorio, this cantata is music for church performance rather than theatre or concert hall. Would not the tonal qualities of cathedral cantors have been more appropriate? A useful addition to the accompanying booklet would have been to provide the original Russian text (transliterated please!) as well as the English and Italian translations, the better to appreciate the sonorous sound of the Russian vowels. I have a suspicion that the (unfortunately anonymous) translator concentrated too much on literal word for word translation, so that the English reads like stilted prose having lost the poetic resonance of the Russian original. These reservations apart, this music is a major discovery and proof positive that great choral writing did not die with Elgar in 1934. It is to be hoped that this cantata will be picked up by choral societies and receive a richly deserved place in the choral repertory.